We are proud of our conservatories, they are all made to measure to suit your property, all work is completed by us. With our enviable local reputation we have the expertise to advise you on the best possible conservatory or orangery to suit your style and budget. You may want a more traditional looking conservatory such as Victorian, Edwardian or Gable style or perhaps you'd prefer a more contemporary style such as a Loggia or Veranda design. Whatever you decide we're sure we'll have something for you. Adding a conservatory is not only an extension of your home and personality but adds value both physically and financially. 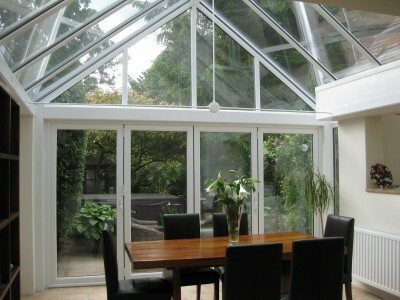 Conservatories can give you that extra needed living space for the family or maybe you're creating a relaxing retreat. A conservatory adds dimension and interest to your home, lets natural light flood in and brings you closer to your garden and nature. Whatever your reason for adding a conservatory or orangery, Windowman will help you achieve your vision. We will discuss your requirements and advise on the best type for you based on your needs and budget. Quality is important to us along with design and affordability, so we make sure all of our customers are included at the design stage and any questions are answered. Our aim is to make sure you are happy with the end result and have a room to be proud of. For more information on our conservatories please call 01992 558637 or contact us by email.